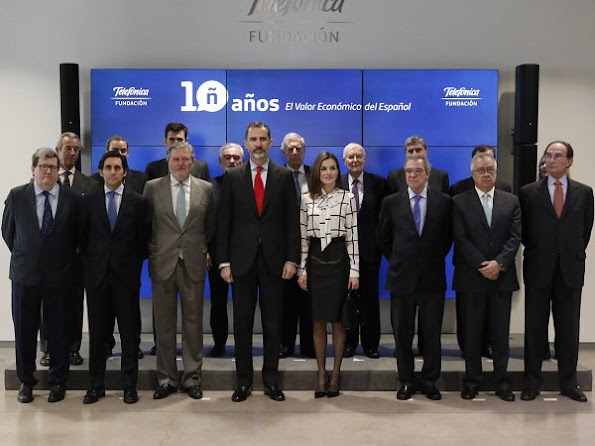 King Felipe of Spain and Queen Letizia of Spain attended the closing meeting of the research project 'The economic value of Spanish' (El Valor Economico del Espanol) at Telefonica Foundation building on February 13, 2017 in Madrid, Spain. Why Letizia Why? Must you torture us with those ghastly leather skirts/ pants ? You are such a beautiful woman,please throw them out of your wardrobe and spare us any more sartorial torture! The leather skirt is great. And why didn't you write the same about Maxima when she wore a burgundy leather skirt in Germany last week? 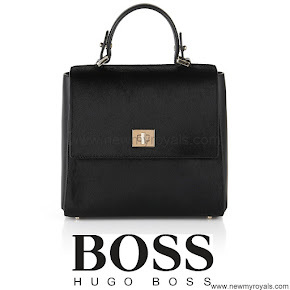 Leather is a great material and can be styled very elegantly. I´m glad that some royal ladies venture into leather territory taking it out of the various corners associated with either country-, biker- och fetish looks. It still needs to be done carefully and well-dosed, but the latest examples we´ve seen were successful and tasteful in my view. Simple and fabulous! I really like this skirt and cape together with her shoes and bag, blouse not so much but on her it looks fantastic. She is definitly one of the most creative royals! Very elegant and professional as always. I must admit I'm not keen on a bow on a blouse. I hated that look when it was around before (70s, 80s?). Either go for classic and clean lines or go for little-girl prissy, but don't mix them up. You are right Romana. I think that is why i like it! I really like the look. Very polished per usual. Everyone has different tastes, but in my opinion when the leather is of high quality and the piece of clothing is well cut and fit, nappa skirts and pants far from being ghastly are downright beautiful and elegant. In Spain the tanning and finishing industrie produces high quality nappa and suede that are expensive, you can find mid-priced pieces at Massimo Dutti, Uterqüe and El Corte Inglés that are quite good too. I dont really like leather. But otherwise, she looks good. Esta es Letizia, moderna, pulida y preciosa. La combinación de zapatos, medias y falda son un éxito total. Me gustaría que la blusa no tuviera lazada, pero es un detalle menor. Me encantan la capa y los zapatos. Su pelo y maquillaje muy conseguidos, como siempre. I like the edgy look of the leather skirt. She balances it well with bold print of the blouce. First you look at MM and all you want to do is shake your head and cover your eyes. Then you look at Letizia and you feel yourself nodding and smiling. I like leather , I like suede and with nice top it looks always elegant like Queen Letizia looks here. De "exactamente", nada. Ni las blusas son iguales, ni las faldas ni los zapatos. Son parecidos. ¿Cuántas veces llevan otras Royals prendas idénticas? Matilde y Máxima, por ejemplo. I think this is gorgeous! There a a lot of things that perhaps could have gone wrong, but it all comes together beautifully. Letizia is wearing almost exactly the same outfit that Queen Rania of Jordan wore on her visit to Madrid in December 2015. Hmmm.